Tired of fighting your kids to get them to take their vitamins? 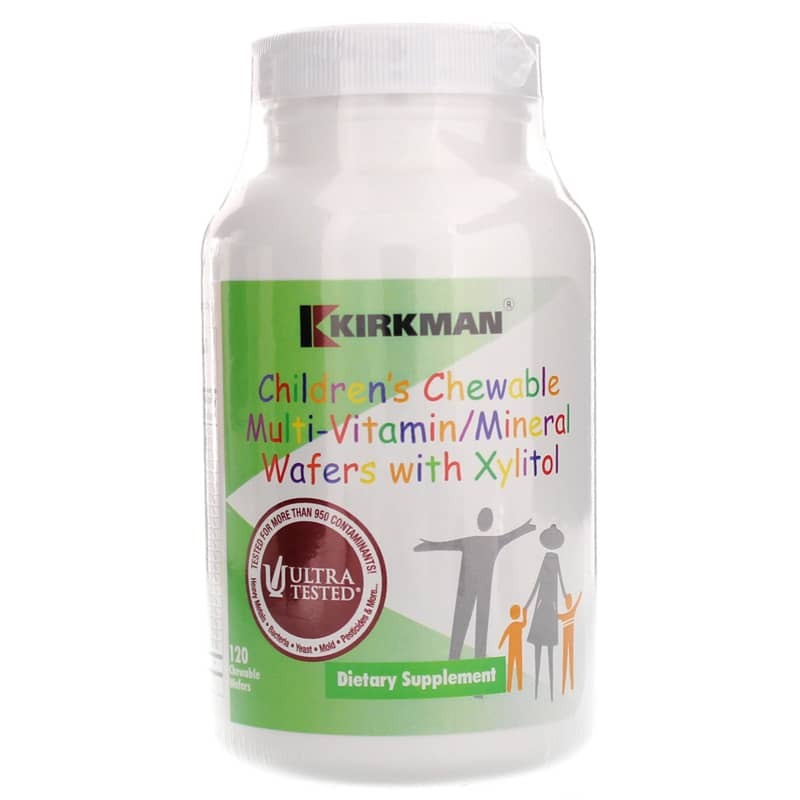 Try Children's Chewable Multi-Vitamin/Mineral Wafers with Xylitol from Kirkman. Specially designed for children, this hypoallergenic multivitamin/mineral comes in great-tasting, peach-mango wafers sweetened with natural xylitol. 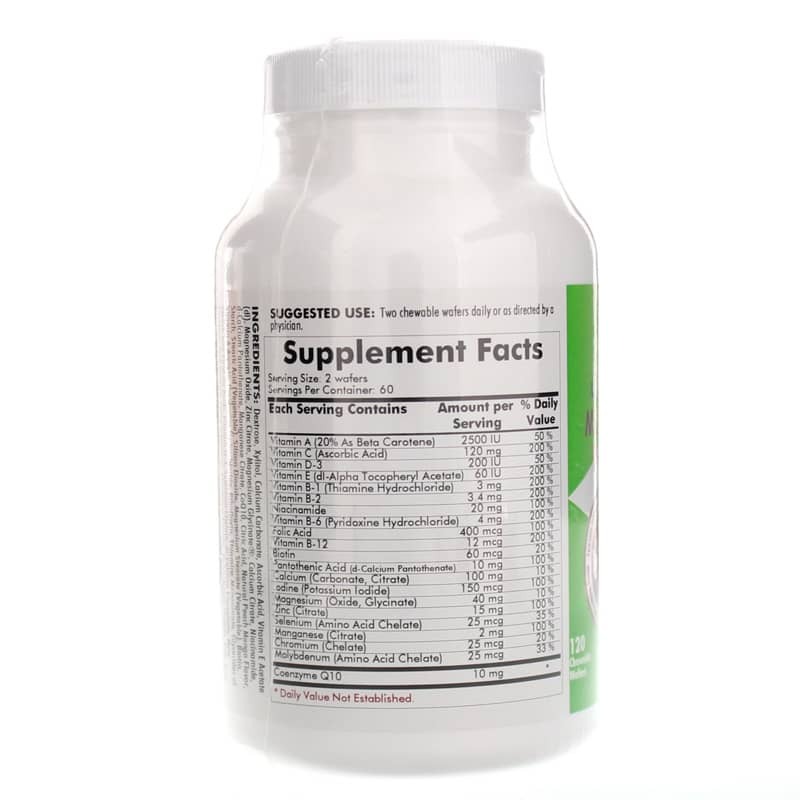 This multivitamin/mineral contains a range of vitamins and minerals growing kids need to be healthy, including vitamins A,C and E, as well as B vitamins and trace minerals. In addition, two wafers include 10 mg coenzyme Q10 for antioxidant support. Unlike many commercially sold kids' vitamins, Kirkman's children's multi has no artificial coal tar coloring or artificial flavoring chemicals that can cause reactions in sensitive children. Made with natural peach-mango flavor and natural sweeteners xylitol and dextrose, this is a vitamin your kids with like to take, and one you can feel good about giving them. It's also free of common allergens like soy, wheat, casein, gluten, milk, egg, yeast, peanuts and tree nuts. Get your kids the nutrition they need without allergens and artificial ingredients. Order Children's Chewable Multi-Vitamin/Mineral Wafers with Xylitol today! 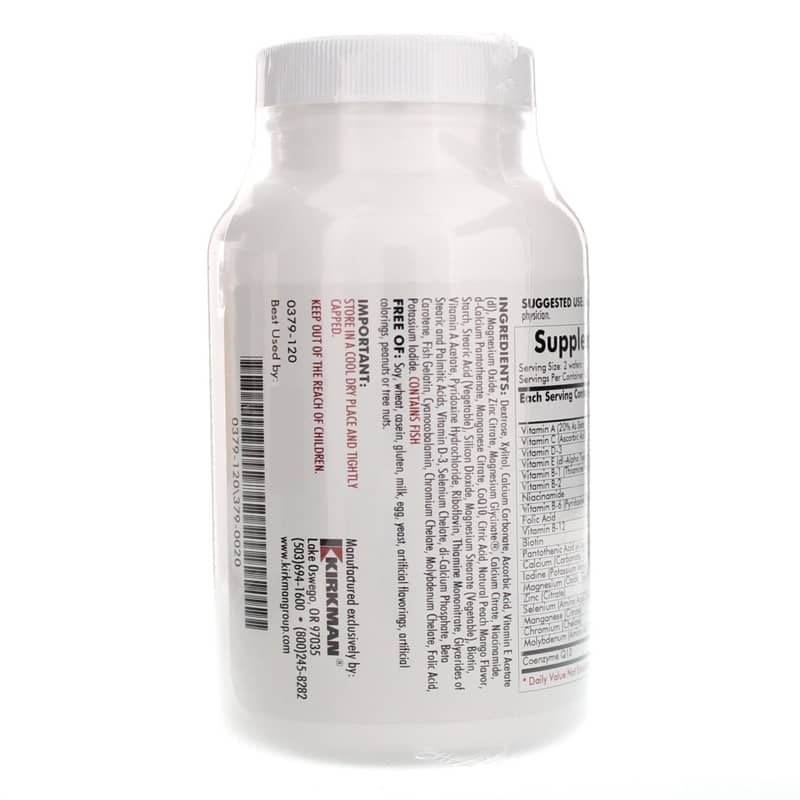 Ingredients: Dextrose, Xylitol, Calcium Carbonate, Ascorbic Acid, Vitamin E Acetate (dl), Magnesium Oxide, Zinc Citrate, Magnesium Glycinate Chelate, Calcium Citrate, Niacinamide, d-Calcium Pantothenate, Manganese Citrate, CoQ10, Citric Acid, Natural Peach Mango Flavor, Starch, Stearic Acid (Vegetable), Silicon Dioxide, Magnesium Stearate (Vegetable), Biotin, Vitamin A Acetate, Pyridoxine Hydrochloride, Riboflavin, Thiamine Mononitrate, Glycerides of Stearic and Palmitic Acids, Vitamin D-3, Selenium Chelate, di-Calcium Phosphate, Beta Carotene, Fish Gelatin, Cyanocobalamin, Chromium Chelate, Molybdenum Chelate, Folic Acid, Potassium Iodide. Contains NO: Casein, gluten, soy, wheat, milk, egg, yeast, artificial colorings, artificial flavorings, peanuts or tree nuts. Adults: Two chewable wafers daily or as directed by a physician. I have been purchasing these Children's chewable vitamins for years, our son seems to do well with them. Hes 19 and strong as a bear,but gentile as a puppy. pricing and delivery is always a blessing.